Katichakrasana is consisted of two words: Kati and Chakra. The meaning of Kati is waist and Chakra means wheel, thus Katichakrasana is a waist rotating standing yoga pose. In fact, in the yogasana, one has to twist the waist right and left respectively. It is a good yoga exercise to shed unnecessary fats from the waistline as well as the lower abdomen thus makes the waist slim, supple and flexible. It is an excellent means to solve the problem of constipation for good. It is known as “Office Yoga” as well as “Classroom Yoga for Children” as it helps to relieve tiredness, stiffness and fatigue in the neck and trunk region. Stand straight with one foot comfortably apart. Both the arms should be out-stretched in front of the chest while palms are facing to each other. It should be ensured that distance between the arms remain constant. With exhale, swing the arms to the right side as far as possible by making waist rotation. Maintain the pose as long as you can. With inhale, bring your arms before the chest. The same thing may be followed while bending your arms towards the left side. Perform it 5 to 10 times or up to two minutes. Burns waist fat: This is one of the effective yoga poses to burn fat at the waistline region. It is also good in burning of fat of the lower abdomen region. Due to regular practicing of this yoga, the waist become supple and slim. Weight Loss: This yoga pose is good to give suitable workout in the lower abdomen area thereby helps in shedding fat of this region. Spine health: It is good to improve the flexibility of the spine and effective for spine injuries and disorders. It helps to contract and expand the muscles of neck, back and abdominal wall and give a smooth massage to the entire vertebral column. Relieves constipation: It overcomes the problems related with indigestion and constipation. It smooths proper bowel movement. 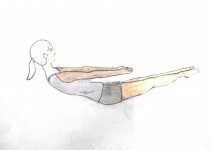 Prevents respiratory problems: It is one of the powerful yoga to make the chest expand and ensures appropriate expanding of lungs. It is good to combat the problems like asthma, cough, tuberculosis, etc. The twisting and compressing help the person to breathe in a better way thus good for asthmatic condition. Strengthens arms: It strengthens shoulders, neck, arms, back and thighs. Boon for sedentary people: Due to its multiple benefits, it shows amazing benefits for those who devote maximum of hours as sitting. Parkinson’s and Alzheimer diseases: It helps to ease muscular stiffness that happens due to Parkinson’s and Alzheimer diseases. Frozen shoulder: The regular practice of this yoga helps to release stiffness and rigidity in the shoulder region thus good to manage frozen shoulder. Enhance digestion: It improves the peristaltic movement and improves digestion. The practicing of Tadasana, Triyak Tadasana and Kati chakrasana is good to solve all the digestive related problems. Manage diabetes: It improves the efficiency of pancreas and regulates the production of pancreatic juice thereby controlling diabetes. Improve Kidney efficiency: The contraction and expansion of muscles help to squeeze out impure blood and replaced by fresh one. It also ensures fluxing of adrenal hormones. Fight depression: Continuous practice of this asana releases pranic energy, acts as a mood elevator. Nervous system: It stimulates the nerves criss-crossing the spinal column thus good for the health of the nervous system. Stimulate manipura chakra: The left –right movements of arms ensure proper exercise to the lower parts of the abdomen and affect the Manipura chakra. Cures Uterus problems: The regular practice of this yogasana is good in treatment of uterus and fallopian tubes problems. It strengthens the arms and leg muscles. One shouldn’t perform Katichakrasana during pregnancy. Don’t practice it if one is having slip disc. Skip this asana while experiencing spinal injuries. It shouldn’t be performed after abdominal surgery. High Blood Pressure patients should perform this asana very cautiously as they may experience giddiness or faintness. Avoid practicing it during cervical spondylitis.